The Berlusconi government seems to be on its last legs here in Italy, but somehow the old Mephistopheles seems to keep controlling the show – apparently bribery as well as arm-twisting has been involved. 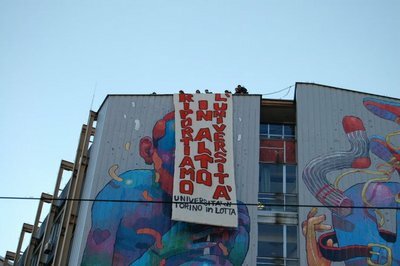 Meanwhile, in Torino, where I’m teaching a mini-seminar, students have occupied many of the University of Torino buildings to protest the reform law currently being pushed through by Education Minister Mariastella Gelmini. Like so many “reforms” carried out by the Berlusconi coalition government, this move is intended to rationalize Italian governance (in this case, of the universities) so that it resembles it more closely resembles that of the U.S. Ironic, given the fact that our system is in hot water as a result of the fiscal crisis of the states, an issue that gets little press either in Italy or in the U.S.
Italian students are impressively militant and remarkably savvy politically speaking. The Gelmini reform is couched in terms of efficiency – something which many aspects of Italian life could certainly use. However, the students argue that the law contains provisions that include privatization of the universities, the cancellation of democratic processes of university governance, precariousness for faculty members, the commodification of knowledge, the creation of toxic hierarchies among university faculty through “merit pay.” Of course, many of these measures are already a taken-for-granted feature of academia in the U.S. 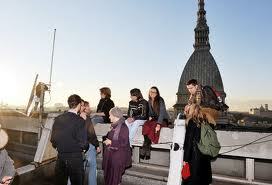 The students in Turin have been quite imaginative in their protests. 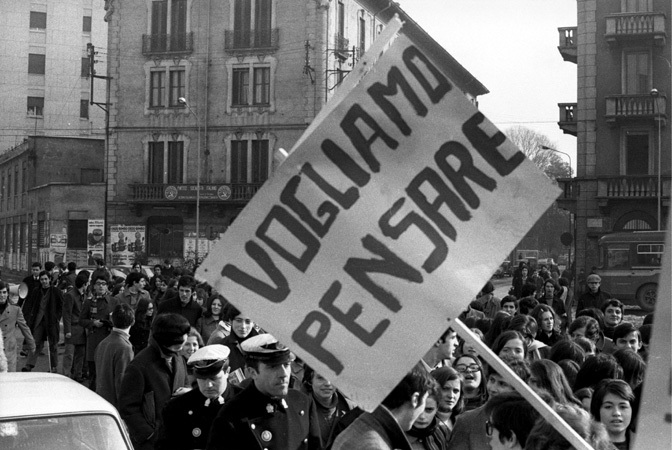 In addition to large marches through the streets of the city (you can still block traffic with a march here in Italy, unlike in the U.S.), the students have instituted a rotating series of occupations of different university buildings, and have also climbed on top of the main building housing the humanities, creating quite a stir among the Italian media. Not so surprisingly, I haven’t noticed anything about these protests in the U.S. media. It seems it takes violence against a member of the aristocracy (I’m thinking here of the British protestors’ attack on Prince Charles a day or two ago) to make it into the headlines. Too bad Italy doesn’t have many members of the royalty in the limelight these days.